Raising the bar in retail. When you're busy running your retail store, having to troubleshoot problems that come up with your payment terminal can be a real setback. The Verifone VX520 keeps payment processing simple and glitch free so that you can focus on your customers. Compact yet powerful, this dual-communication terminal is easy to use and features advanced security technology that updates itself so you don't have to. Effortlessly accept EMV chip cards and mobile payments like Apple Pay, Samsung Pay and Android Pay. The VX805 PIN pad plugs in seamlessly if you want a customer-facing PIN pad. More of a one trick terminal kind of store? 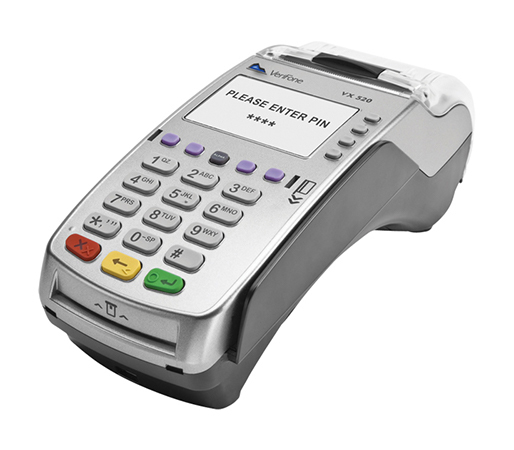 We internally encrypt your VX520 so you can pass it to the customer and accept PIN debit payments that way. Small enough to fit in the palm of your hand at 1.1 pounds, this high-speed terminal is a space-saver at check out. The VX520 is built to be durable and ergonomic, making it suitable for all retail environments. Dimensions: 8" x 3" x 3.4"
Looking for a wireless option? Check out the Verifone VX680.